So when I say yellow, I mean very yellow, buttercup yellow, daffodil yellow, beautiful cheery yellow. 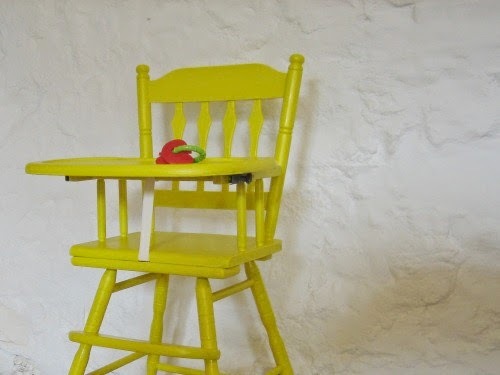 It is very bright, but I think beautiful colour for a piece of furniture which was sad and sorry for itself. 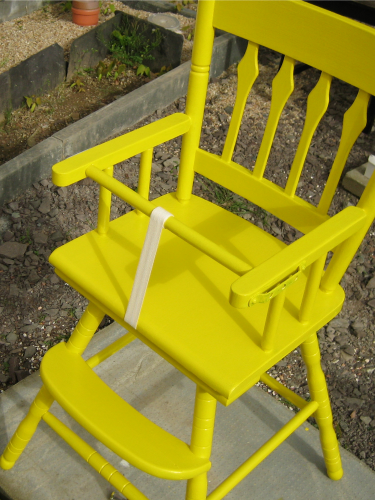 The chair had been left in our shed for a couple of years, it had stayed dry but the varnish was badly peeling, the strap was a bit funky and the tray was badly marked. 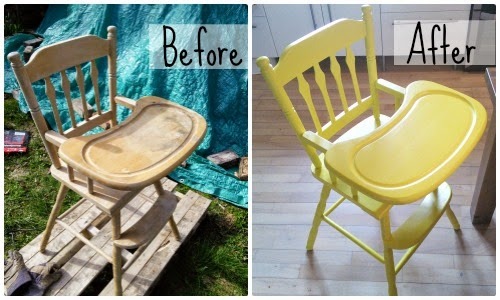 John sanded the chair down and we gave it 2 coats of undercoat. 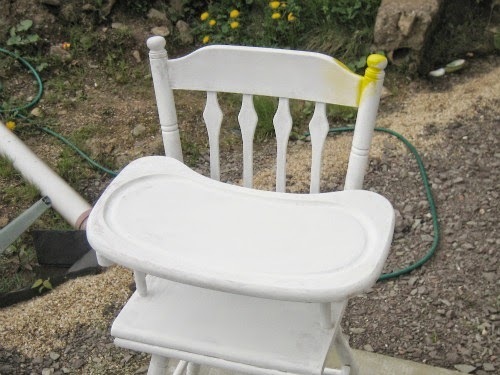 Then I took the chair apart sanded it all over again - you always get drips and blobs on the spindles and corners, unless you are VERY careful, I am, at best, moderately careful. I fitted a new betweeny leg strap thingy. 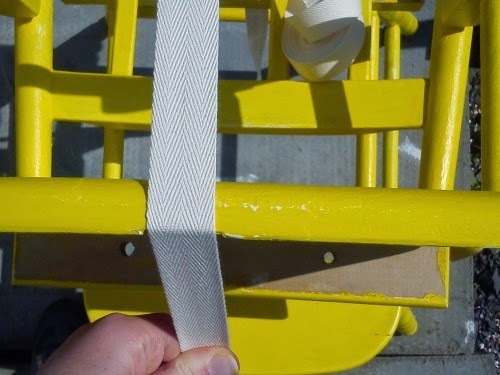 Using a staple gun to secure the strap across the top bar, then looping round and fitting to the underside of the chair, where it will be hidden when the chair goes back together. Left her out to dry for 2 days, we were lucky to have a couple of warm dry days just at the right time. 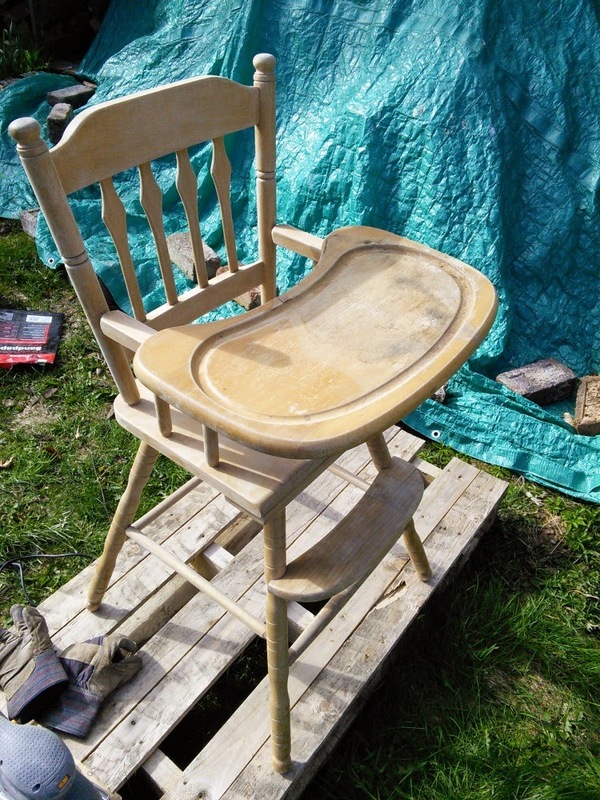 A chair with as many corners and tricky bits as this still needs a week or so of curing indoors before it is usable, if it still smells of paint, it isn't ready. So 2 weeks after I finished painting it and voila! 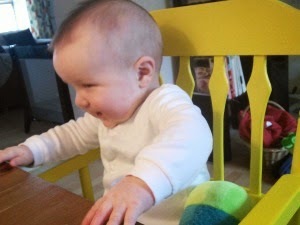 And here we have the proof of a job well done - a dribbling, giggling, wobbly Teeny enjoying his very own high chair. 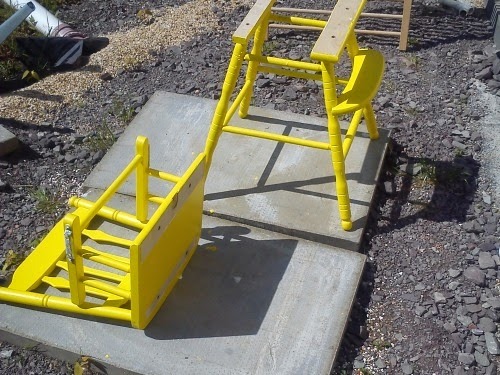 And Finally, who doesn't love a before and after shot? Our chair is 20+ years old, it was a hand-me-down from my sister - check out second hand shops and eBay or Gumtree for similar styles at the best prices. 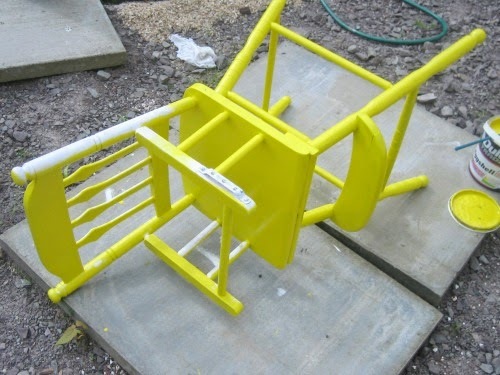 Such a happy looking highchair. Hello Ann! I missed you this week!